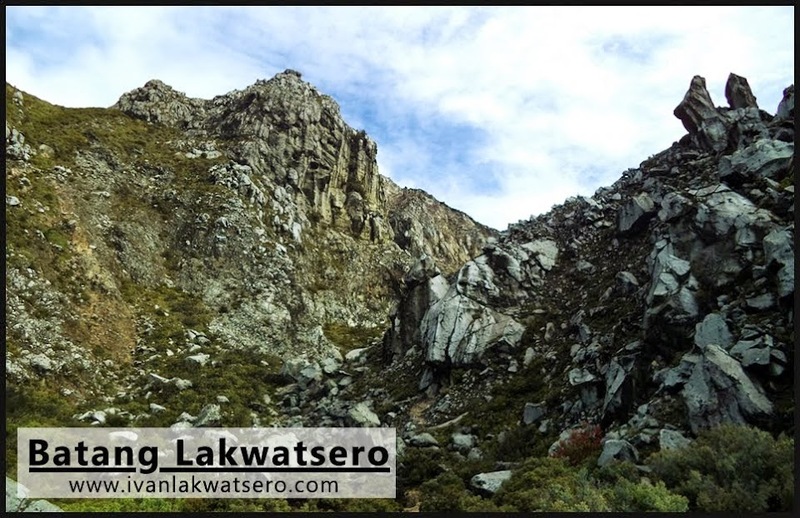 Batang Lakwatsero: Hiking Goals | Achieving "Pilipinas 1-2-3"
Hiking Goals | Achieving "Pilipinas 1-2-3"
The year was 2013. I was only 21... young, spirited, full of passion and carefree. I had a decent job, but earning too little, maybe just enough to fund the daily needs of a corporate slave. But who would have thought? That the young, spirited, passionate and carefree me would be able to complete the so called "Pilipinas 1-2-3". 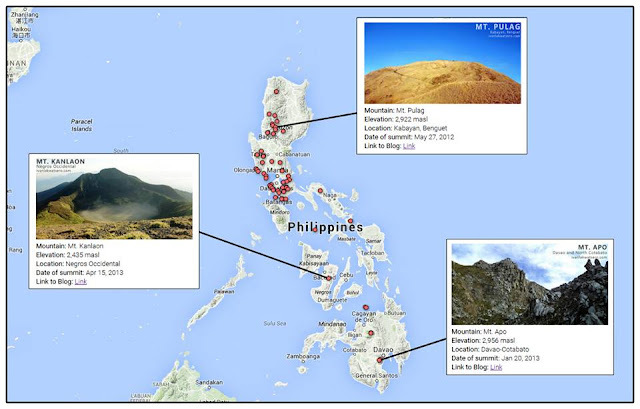 For those who are not familiar, "Pilipinas 1-2-3" is the term coined by the Philippine mountaineering community to collectively name the three mountains, highest in each island group in the Philippines. We have Mt. Pulag (2,922 meters above sea level) for Luzon, Mt. Kanlaon (2,435 meters above sea level) for Visayas, and of course, Mt. Apo (2,956 meters above sea level) for Mindanao. 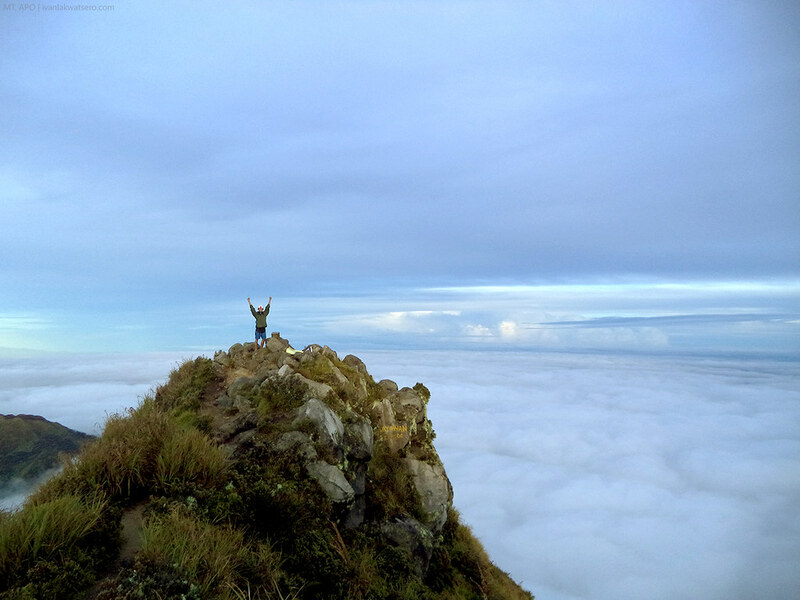 Given the beauty and prestige in hiking the three mountains, it is very likely for many, especially the budding hikers or mountaineers who look forward to explore all the mountains of the Philippines one day, to really aspire for the summit of Pilipinas 1-2-3. So how did I achieve it? I was only 21, earning too little, passion at energy lang 'ata ang puhunan ko. location of Pilipinas 1-2-3 on the map of the Philippines. Everybody knows that hiking isn't cheap. Especially if you're new to the sports and do not have the necessary stuff to go into battle. Apart from that, fares are truly expensive, not to mention the pricey registration fees, guide fees, porter fees, and a lot more. Lalo na sa Visayas and Mindanao legs ng Pilipinas 1-2-3. So here is my tip, if you can't afford it, don't go... learn to wait and save for it. Kasi naman noh, it is not as if the mountain will leave its place tomorrow or the following day. Believe it or not, the mountain will be just there and outlive you and your great great descendant. I was only 19 when I first tasted hiking, and it was addicting. I was only a college student back then and often broke. What I did is I saved my baon everyday to be able to hike a mountain the next month. Same goes when I got hired in my first job, I kept a fraction of my salary every month to be able to fund my hiking addiction. In all of my hikes across the Philippines, I would save budget for it. As a general rule for myself, if I cannot afford it now, maybe I can afford it later, once I saved up a budget for it. Like this hike in Mt. 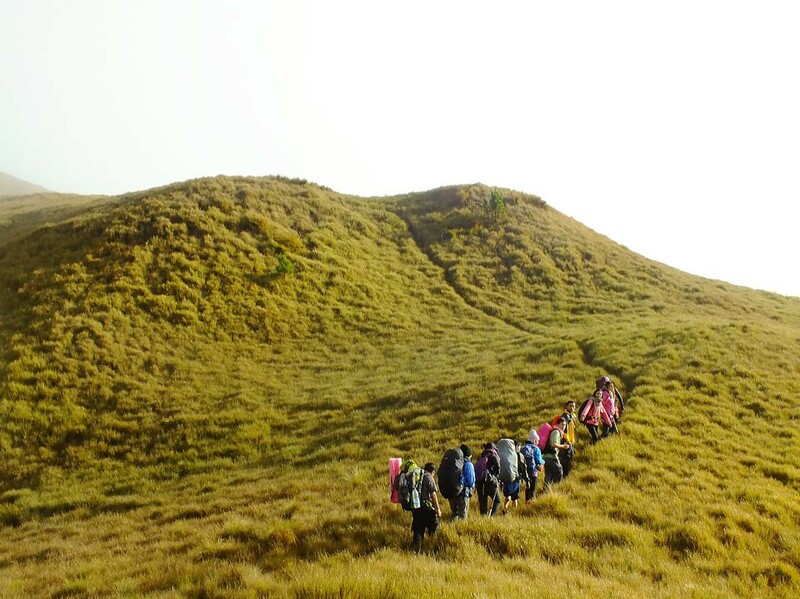 Pulag which we did in May 2013, I was able to join the fun because I had extra savings that time. Read our Mt. 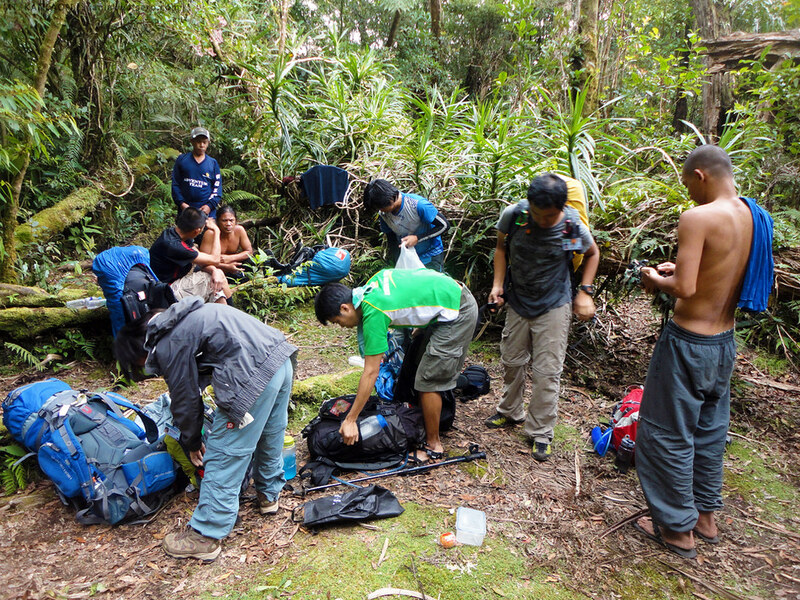 Pulag Adventure via Akiki-Tawangan. More often than not, hiking with your friends, or kung wala kang friend, with a group of people, will help you achieve your hiking goals. 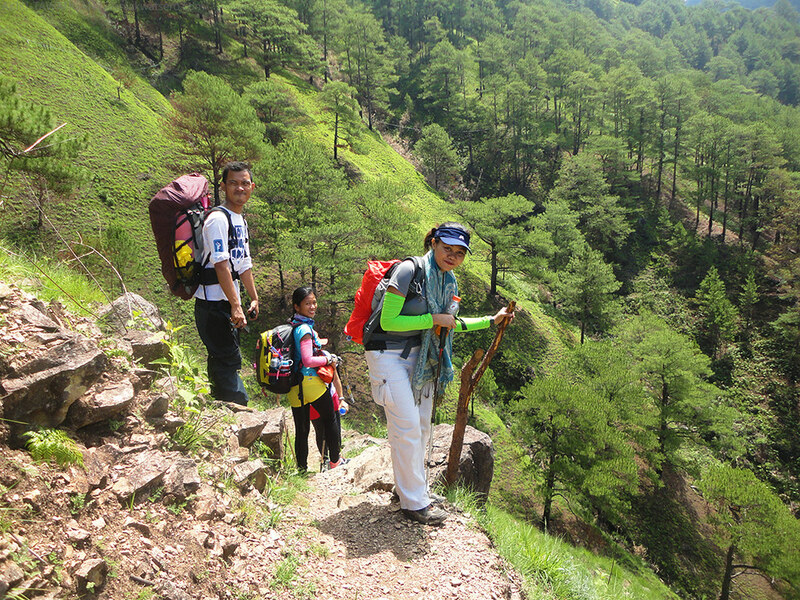 The reason is simple, aside from it is fun to hike with friends, you will have a group to split the cost of expensive fees. But here's the catch, applicable lang ito kung yung friends mo ay hindi drawing at may kaparehong interes sa pag-akyat sa kabundukan. If you do not have friends who share the same passion, look for groups who will climb the mountain and ask if you can tag along. Given the number of climb organizers we now have, pasulpot-sulpot lang sila sa Facebook groups, going to Mt. Apo or Mt. Kanlaon or Mt. Pulag is a lot easier. In January 2013, I joined an epic hike to Mt. Talomo-Apo. The experience was extreme. 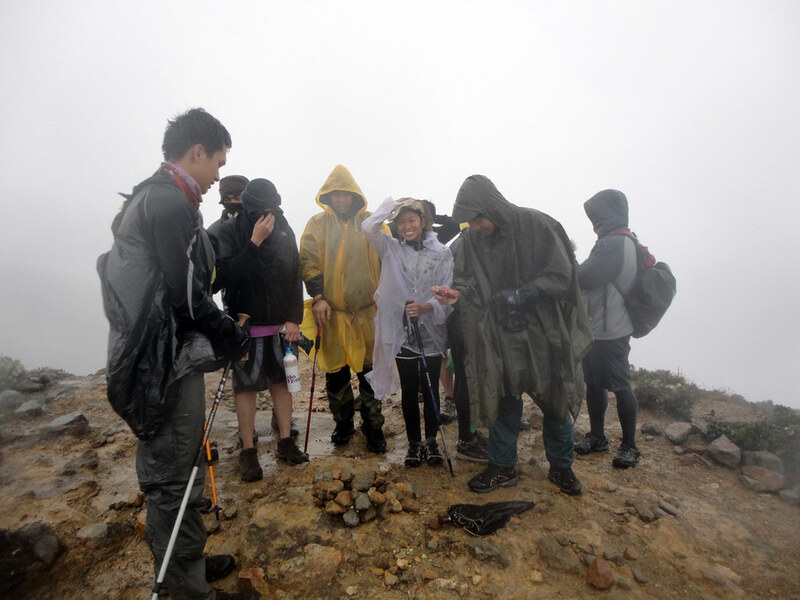 The lengthy wild trails were a big challenge, and to top it off, we were welcomed by a typhoon at the summit of Mt. Apo. Yet still we can show off a big smile. Read our Mt. Apo-Talomo Megatraverse. If you live in Manila, or in any part of Luzon, booking a flight to Negros for Mt. Kanlaon or to Davao for Mt. Apo, could be really very expensive. One way ticket from MNL to DVO or BCD could play at around 2500Php or 3500Php, and of course this is expensive for someone who's not earning enough to fund the luxuries of life. And for this, hunting for seat sales or even "piso fare" is necessary. But to be able to do that, you will need to plan ahead, as in months ahead. My hikes in Mt. Kanlaon and Mt. Apo were all made possible because I was lucky to book promo fares. Like in our Mt. Kanlaon hike, I think we planned this 6 months ahead of time, so I booked for my plane tickets around September or October of 2012 for our hike in April 2013. Read our Mt. 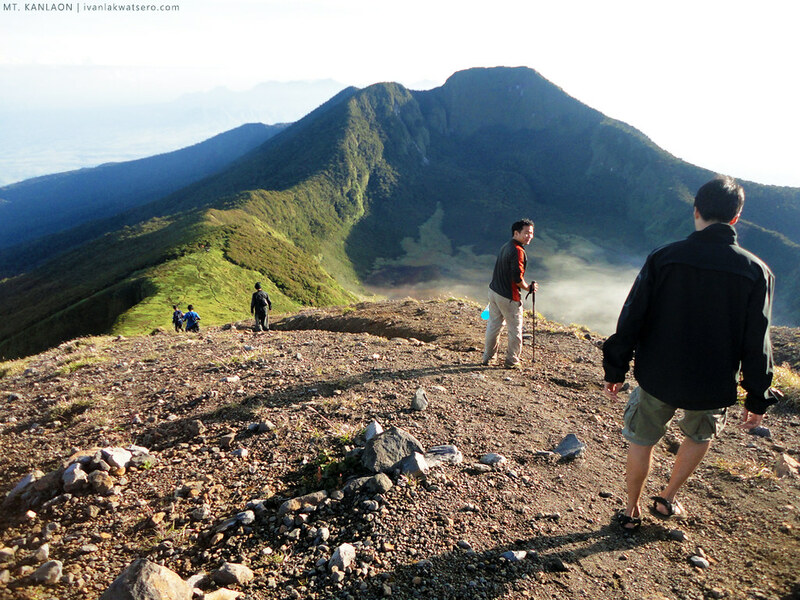 Kanlaon Traverse. While it can indeed help you save time and effort, packaged tours are always a lot more expensive. So going DIY, or Do-It-Yourself, is the trend nowadays. Google is your friend, and there are many blogs to help your research, like maybe this blog, ehem, Batang Lakwatsero. Essential information to look for are the fares, current rates for guides and porters, and existing registration fees. Don't forget to research for the basics as well --- how to go there, where to register, where to hire guides, what to expect on the trails, where to get the water, where to camp. Also check for the weather and if the mountain is even open for hiking. In this Mt. Pulag traverse via Akiki-Tawangan trail, everything was DIY, thanks to my friends who are extremely kuripot. My friends organized for everything, and it's actually easy if only you would use google. From the usual budget of 2,500php, I think this hike cost only 1,800Php. Don't bring everything! If you want to successfully reach the peak of Mt. Apo, or Mt. Pulag, or Mt. Kanlaon, make sure you only bring what is needed. If you're climbing with your friends, delegate. It would be also wise to have one or two porter bags where communal stuff like camp food, cook sets, water containers, and tents. Too much load can hamper your goal to the summit. Most of the time, I only carry a backpack loaded with my personal stuff --- sets of clothes, mess kit, blanket, jacket, and trail food and water. We often hire one porter who will carry our camping stuff. 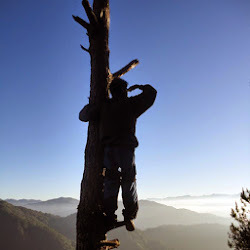 Believe it or not, it will not make you more macho by not hiring one or two porters. It will only feed your ego. I mean why not? Having a local contact to help you arrange for pre-climb paper works or any preparations for that matter can be very beneficial. This is especially true if you failed in your first attempt to summit Mt. Apo or Mt. Kanlaon, which for many are very elusive due to several circumstances. He could be your previous guide, or porter, or someone from the local office. And besides, having a new friend is not a bad idea at all. 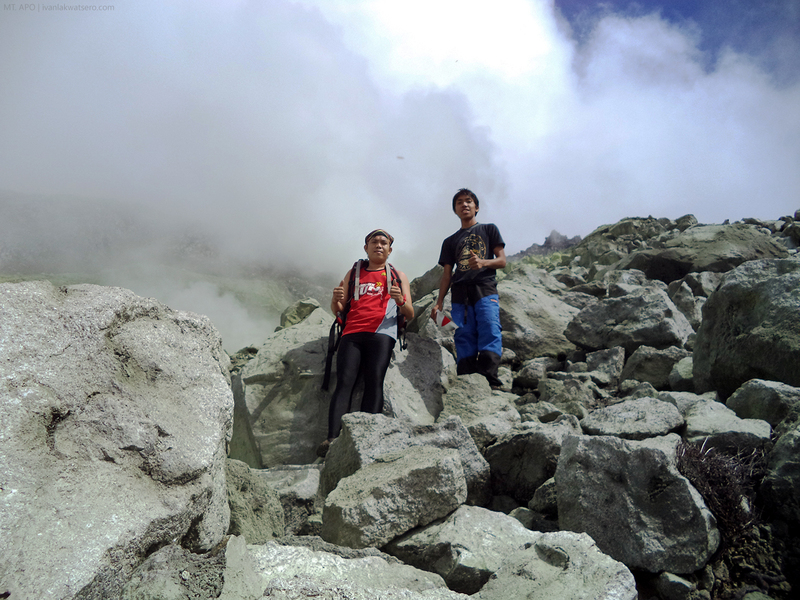 With my friend ArJ, a Davaoeño, along the boulder trail of Mt. Apo during my 2nd attempt in August 2013. He helped me arrange for this supposedly solo hike to the summit of Mt. Apo when we were hit by a storm during our 1st attempt in January 2013. Read our Mt. Apo via Boulders Adventure. When you're young, you're often full of energy and passion! Make use of it to your advantage. You cannot take back time, your passion and energy in your early 20s is not the same with your energy when you reach 26, and it will further as you grow older. I can testify to that, kung dati halos 3-4 times ako umaakyat every month, ngayon halos 3-4 time na lang sa isang taon. The difference is significant. Totoo nga, there will be more responsibilities as you grow older, and your priorities in life will change. So do it while you're still young, while your energy and passion are at their highest, and while you're still not bound with life's responsibilities. But I'm not saying na magpaka-YOLO na lang habang-buhay ah, don't forget pa rin to be responsible for your retirement at huwag i-asa sa magiging anak, asawa, at lalo na sa mga magulang ang pagtanda. What I'm only saying is, it is more likely to achieve your hiking goals during your youth, your prime. At the roof of the Philippines, Mt. Apo. Above the clouds. Reached at the age 21.